Middlesbrough, Leeds and Bradford are the only Football League clubs left in this season’s Capitol One Cup (League Cup in old money) after they beat Premier League clubs Sunderland, Southampton and Wigan respectively. You’re unlikely to find a harsher critic of the Capitol One Cup than myself but Boro, Leeds and Bradford have all done brilliantly to reach the quarter finals. However it’s Bradford that’ll receive most of my attention in this entry. 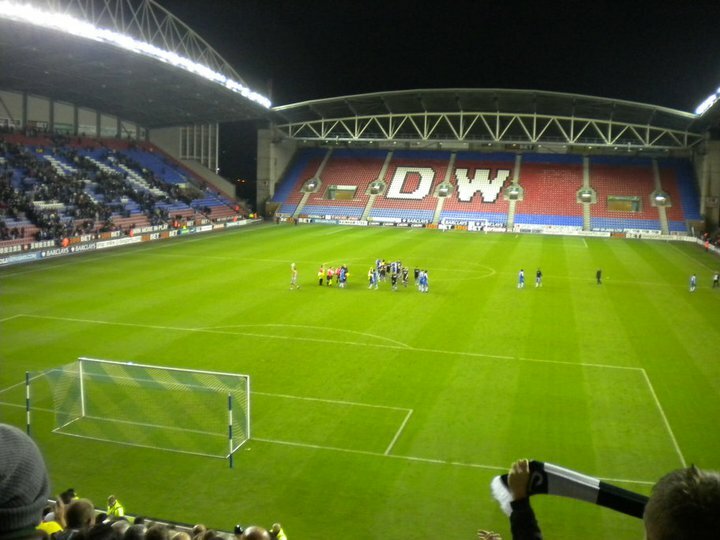 Nearly half the 11,777 attendance at Wigan’s DW Stadium had travelled from Yorkshire and the Bradford fans played a massive part in a great night for the Bantams. On the pitch a unified, stoic display from the League 2 side took the game to a penalty shoot-out, which Bradford won 4-3. As is expected in the much-maligned cup, Wigan made several changes but their team still included Premier League regulars like Al-Habsi, Ramis and Gomez. Bradford’s changes on the other hand were forced upon them due to injuries and suspensions picked up in their 1-0 loss to Burton. But Phil Parkinson’s side showed their spirit, combating Wigan’s free-flowing passing and limiting their opponent’s chances. When Wigan got their rare shooting opportunities they were denied. Bradford’s resilience paid dividends as they held out for penalties. Doyle, Jones, Darby and Connell all converted their spot-kicks for Bradford. Scottish international Shaun Maloney blasted his over the bar for Wigan before Gomez capped off his miserable night watching his tame effort get saved by the brilliant Matt Duke. Incidentally this was City’s seventh penalty shoot-out victory in the last three years. Last night was a great night for a club that’s enjoyed very little success or luck since its relegation from the Premier League in 2001. Following their relegation from the top flight the Bantams have suffered three relegations, numerous brushes with bankruptcy and very little success. Since arriving in League 2 they’ve constantly finished closer to the bottom of the league than the top and last year they had a real relegation scare. However this year for the first time in many years there’s an air of positivity around Valley Parade. The club are currently in the play-off spots after a good start to the season which sees them unbeaten at home. City have some very good players in their current squad. Matt Duke is a goal-keeper that I’ve long admired; a confident shot-stopper that for some reason has failed to settle at any club he’s joined since leaving Hull City. Zavon Hines is a tricky, attack-minded winger who should be playing at a higher level. In truth the club should be playing at a higher level. For the past few seasons they’ve had by far the highest attendances in the division despite constantly underperforming. This season they’ve averaged 9,977 fans at home; more than 21 League 1 clubs and two Championship clubs. They’re the third best supported club in Yorkshire behind the two Sheffield giants and Leeds United. Because of the reasons listed above I hope they don’t get too wrapped up in the hype of the cup. Cup runs, particularly Capital One Cup runs have a horrible tendency to destroy seasons for clubs in the Football League. Teams that have looked destined for promotion have seen their hopes dashed by over-involvement in the cup. Of course the cup can give clubs a major short-term boost but more often than not it consumes everybody’s thoughts. No matter how much you try to put the cup to the back of your head it’s always there! After all the prospect of playing Arsenal or Man Utd is far more exciting than an away game against Exeter on a Tuesday night! For the first time in over a decade Bradford City have the chance to get promoted. Bradford fans finally have good reason to be proud of their club once again. They finally have a team that matches the club’s size and stature. I just hope the cup doesn’t derail their promotion push. Because it’s a very long season, and though they may feel fresh and excited now, these extra games could haunt them in February, March or April. Bradford City are a whale in a fishbowl in League 2. They need promotion and Phil Parkinson needs to let everybody remember what the ultimate aim is for this season. This entry was posted in Football, League 2 and tagged 0-0, Bradford, Bradford City, Capital One, Capital One Cup, Championship, Duke, football, Hines, Jordi Gomez, League 2, League Cup, Leeds, Leeds United, Martinez, Parkinson, penalties, Premier League, promotion, Southampton, Wigan, Wigan Athletic on October 31, 2012 by gutollewelyn.